1. My favorite song is "Melt With You" by Modern English. 2. I have a crush on Adam from Man vs. Food. It's his little boy eyes. Plus, he reminds me of John Goodman whom I LOVE. 3. I love to go to Denny's. I like the comfort food and the free Diet Coke refills while I sit for long periods of time and write lists on napkins. 4. I didn't get my drivers license until I turned twenty five. It felt like too much responsibility. 5. During my freshman year in high school, I started collecting vintage hats and purses. I sold them when I was nineteen and I've regretted it ever since. 6. The first concert I ever went to was at Dodgers Stadium. I saw The Cure, Love and Rockets and The Pixies. I was thirteen and I wore a tie dye t-shirt and felt like a dork. 7. One of my most cherished possessions is a plate that was brought across the plains in a handcart. It survived a house fire, and the long trek from England. I sometimes wonder why my ancestors thought it was so important. I adore it. 8. I was a termite inspector for a short while, an Orkin lady. I loved it because I felt like I was going on archaeological digs every time I shimmied into the crawl space of a customer's house. This is gross but once I found a mummified cat under a house. I took it and wrapped it up in a blanket and put it in my trunk. I was going to share it with my family, it seemed so educational and interesting to me. I went to Hollywood to see Sleater-Kinney that night. I worried all night that I would get pulled over with a mummified cat in my trunk. 9. I am very particular about communication. I think thank you notes are the most lovely little gesture. I don't like calling people on the phone; I feel like I am intruding. But I do like talking on the phone to friends, if they call. If I'm down in the dumps, I don't answer the phone. I love to have one-on-one time with friends. I tend to be quiet in groups. 10. 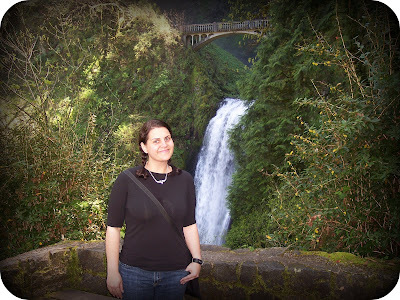 One of my favorite places to visit is Multnomah Falls. My Grandfather would hike up to the top when he was a young boy and sit on a big rock. My parents would take us there when we were young and I desperately wanted to find that big rock at the top of the falls. I had asthma and I could never make it. Dan took me there on our honeymoon and I made it to the top. I've never been so happy or proud of myself. Thanks for tagging me Lindsey. I love your "10 Things About Me". I also love Dennys, didn't learn how to drive til I was 25, am quiet in groups and had asthma which caused me to stop running track when I was younger. I was really fast, too! Thanks for visiting GirlWhimsy, today! I have added you to my list of "whimsical blog love." Have a lovely evening! loving this list. and that is such a beautiful picture of you. Thanks for sharing -- you're so incredibly lovely. WOW Kat---I had no idea about some of these things. I loved reading this. I never would have guessed your love for Denny's----so good to know. Sounds like you probably have some good memories there. I LOVE comfort food---and making lists. I would love to see you special plate some day. What an amazing keepsake. Your ancestors are so lucky to have someone like you who would continue to love and take care of their special plate. I'm a so similar to you when it comes to the phone. Mummified cat!?! That just gives me the chills. I don't think I could have crawled in people's crawl spaces. I never could have made it as an Orkin girl. I'm claustrophobic----and I would be too scared I would run into things like mummified cats. What a great list you have! !